CG Proves Stairs Can Be Conquered — But Carefully! This is one of my favorite post topics from my old blog. Nearly two years ago I moved into a two-story apartment with three of my friends. Finding an apartment for four girls was a challenge, and we soon learned that if we were all going to live together, stairs needed to be part of the equation. This terrified me as I kept worrying about how CG would do on the stairs. My roommates knew of my concerns; unfortunately, we couldn’t find a place without stairs. Even after we signed the lease I was still having mini panic attacks wondering how CG would manage the stairs. I eventually resigned to the fact that if need be, we’d simply barricade the stairs, and CG would be carried up and down as needed. In my mind, stairs were a no for CG. Part of my terror stemmed from an experience CG had when he was a kitten. Back then, I had brought him to my mom’s home for a day visit. She has hardwood stairs, which I knew he wouldn’t be able to manage (especially back when he was a kitten), so we barricaded them with a few boxes. Well, wouldn’t you know it, that stinker saw it as a challenge. During the afternoon, when we were all upstairs, I realized I hadn’t seen my wobbler in a while, so I went looking for him. You wouldn’t believe what I saw. There was CG, on the other side of the box barrier, slowly scooting his bum down from one stair to the next. And then it happened. He had a CH moment and suddenly he wasn’t scooting down the stairs, rather he was somersaulting to the bottom. My heart stopped as I raced to him. I nearly died wondering if he had. Thankfully, he was fine. But I wasn’t. That experience concerned me so much that I never wanted him to be in that position again. So the thought that CG would have to live with stairs was truly a nightmare. My fear was lessened a bit when I took CG to my brother’s home. My brother has carpeted stairs, and although I wanted to keep CG from trying them, he ended up spending a better part of the afternoon pacing up and down the stairs. It was almost as if he was practicing. We were so impressed. He wasn’t able to manage them perfectly, as you could almost see it in his face that each step down was very planned and deliberate. Then the big day came. I moved all of my stuff into the new apartment, then came CG. Of course my bedroom was on the second floor, so the stairs would be a big part of my life, even if they weren’t for CG. Although these stairs were carpeted, they were some of the most oddly laid out stairs I have ever seen. The first half of the staircase was a straight shot up. But then it turned 90 degrees to a very tight S-shaped turn. It was difficult for us girls to manage at first, and I couldn’t imagine how CG ever would. So we placed him at the bottom of the stairs and waited. 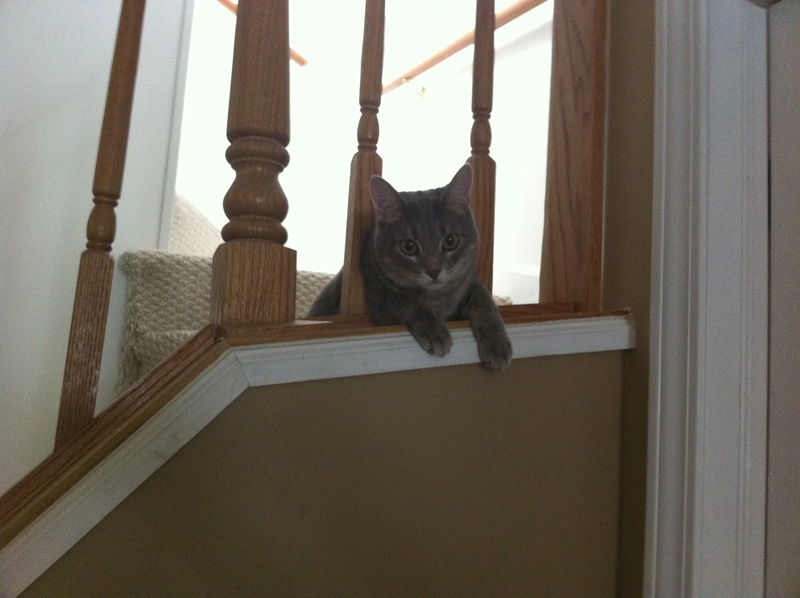 Wouldn’t you know it — that cat climbed all 30-some stairs to the very top. There were a few moments when he’d grab on to one and as he reached the other paw up that side of his body would fly backward, but he did it. I was absolutely stunned. I was still concerned as there was still the occasional tumble, but I couldn’t believe what CG had accomplished. To be honest, when he reached the top, I don’t think he believed it either. As the year went on, CG grew quite capable on those stairs, both going up and down. He had a few accidents along the way, but nothing too major thank goodness. Needless to say, at the end of that year, I was relieved to move out because of the stairs. Now my husband and I live in a single-story apartment, so stairs aren’t a problem for him. While I’m secretly glad that they’re no longer a part of the equation (especially for Ellie’s sake), I’ll never forget how for one year CG did the seemingly impossible. I wish I was as brave as he! 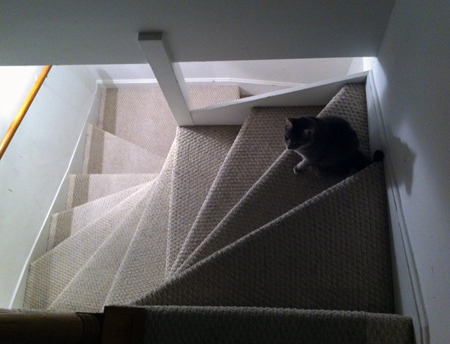 Can your cat manage stairs? Share here!